The Society has its own archive and search room at 52 Overhaugh St, Galashiels, TD1 1DP, Scotland, and this houses our collection of family history material, our own and other publications, which are available for visitors to do their own research. Our own and some other publications may be purchased here, when the search room is open. It's free to do research however donations are very welcome. If you're unable to come on those days, we may be able to arrange access at other times by reservation at least a week in advance. For reservations, please make an Archive Appointment Request quoting your email address as well your name, and desired appointment date and time. Please make sure you have confirmation before assuming the booking is definite. We would appreciate as much prior notice as possible. See this map or our transport to the archive page for directions to 52 Overhaugh St. 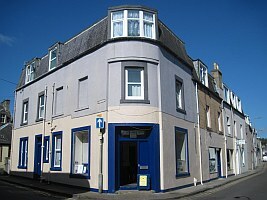 The Archive is on the corner of Overhaugh St and Bank Close. There is no parking by the Archive. Short term parking may be available in Bank Street which runs parallel to Overhaugh St.
Further away, there are car parks at Tesco and Asda where you can park at no cost for 3 hours. The archive is about 5 minutes walk from Galashiels Bus/Rail Station (also known as Galashiels Interchange) in Stirling St.
Search the category index and the topic index to the Books and Pamphlets. Look at the CD Catalogue for the CDs which can be used on the computers in the Archive. Look at the Microfiche Catalogue - these microfiche sheets and microfilms which can be used on the microfiche readers or the microfiche reader/printer in the Archive. Search the surname index to the paper and GEDCOM Family Trees (Pedigree Charts).